Fretwork is a form of decoration usually seen on wood and metal panels. It was particularly popular in the late 19th and early 20th century as a means of adding style to architecture, furniture and household items such as radios. 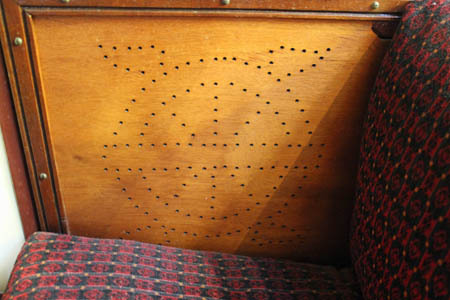 Interestingly, the B-type bus also had distinctive fretwork motifs inside the lower deck saloon. 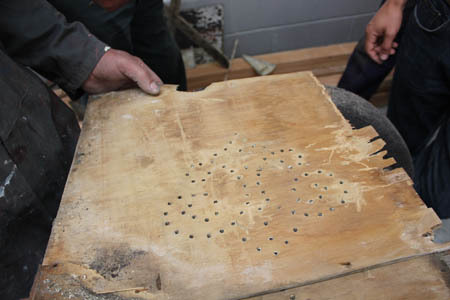 Situated at the end of each aisle of seats, they were constructed through a series of drilled holes. During the restoration process, a number of designs were discovered which differ from the fretwork present in the B-type (B340) held in our Covent Garden museum. B340 is decorated with a London General Omnibus Company emblem – the distinctive winged wheel which was the basis of the London Underground roundel. Other popular designs included the outline of a star, an attractive fleur-de-lis and a clover leaf. The decorations were simply aesthetic additions to the saloon area which would have otherwise remained rather plain. This kind of decoration was a legacy of the horse bus era, when such fretwork was common. The B-type was the last London bus to display wooden fretwork and the practice soon disappeared. Buses became further standardised and there was no room for the intricate and unique detailing that had been a hallmark of their predecessors.